Thread: New 65 gallon tank - feedback welcome. I just setup a new 65 gallon African cichlid tank and I'm new to cichlids. 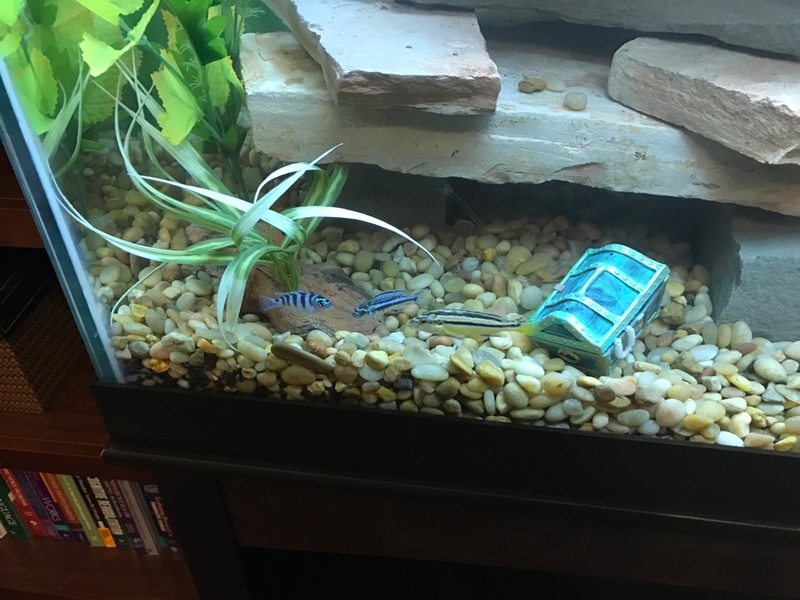 I purchased a few mbuna fish (That's what I think they are...still learning). I have a Fluval 70 power filter. Would love some feedback before I progress too far with stocking. 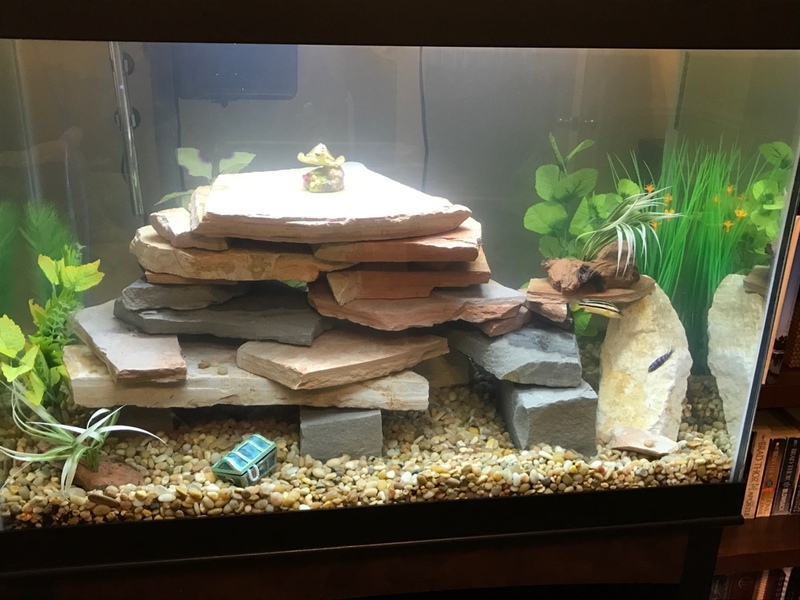 I'd switch out the gravel for sand, easier to clean and maintain water quality, what are the dimensions of the tank, looks like a tall vs. long? You have some species there that grow to be very territorial, which in tight confines translates into aggressive. I just thought you should be aware in case no one has mentioned it to you. They may be fine for awhile but as they hit sexual maturity you may well have problems with them in a 36" tank. Good move with all the hiding spaces, though I doubt they'll be enough to solve that for you in the long run. Enjoy for now but keep an open mind wrt future plans. Thanks for the info. I researched the fish after I purchased them. I asked a few questions regarding aggression initially, but didn't get the best advice. I'll address if problems arise. I don't have much knowledge of the bigger mbuna, as I've always had dwarfs, but a 36" in tank isn't much bigger than my 30"in one so I'm thinking you might be better looking at some of the same ones if you start having problems with your guys. Sadly with cichlids it's more about the footpath than it is the volume of water. My personal favorites are Rustys (Iodotropheus sprengerae) and Saulosi (Pseudotropheus saulosi). I had a list going at once point of good tankmates/species only for smaller tanks. Since yours is a bit bigger you might be able to get away with 2-3 quads of different species. I can find that list if you are interested. Last edited by AmayaOkami; 10-13-2016 at 09:13 AM. The only drawback to sand I find - be careful how you clean your glass if you have sand in the tank. Any kind of scrubbing pad is apt to get the odd grain embedded in it and can really scratch up the glass. The type of scraper with a stainless steel blade is preferable when using sand imho. Agree with you DogWalker, sand requires a bit of caution when cleaning. In this case, the op's tank with all the rock work in that small of a footprint, getting the gravel vacuumed out properly is going to be a nightmare. 125 gallon frontosa tank and 36 gallon tang tank help needed. My 220g Malawi tank. Feedback please.